Canada gets an ultra-exclusive 2019 BRZ RAIU Edition. See what sets it apart. There have been rumors of the BRZ sports coupe being axed because Toyota could drop the 86 sports car. But it looks like it won’t be a death sentence for the BRZ and Subaru will likely keep the only rear-drive car in their lineup alive. The BRZ sells well in Canada in spite of it being rear-drive. It’s still one of the most affordable small sports cars on the planet and performance fans in Canada get an ultra-exclusive model this new year. 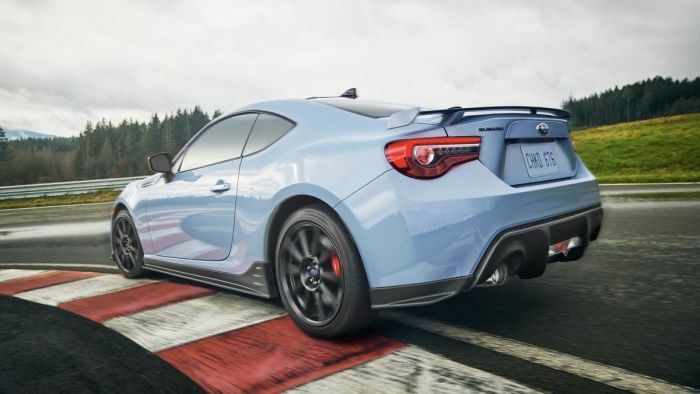 Subaru Canada just announced a new Limited Edition 2019 Subaru BRZ RAIU special model, but you better act quickly if you want one. SCI says only 100 examples will be produced for performance fans north of the border. This Canadian-exclusive sports coupe joins the special edition WRX of the same name launched last year. The word RAIU is Japanese for thunderstorm or lightning storm which is what the Japanese automaker wants this new limited edition BRZ to be. Unfortunately, the RAIU Edition doesn’t get any power upgrades and comes with the same 205 horsepower and 156 lb.-ft. of torque 2.0-liter Boxer engine that’s under the hood in the standard model. It comes mated with a six-speed manual gearbox with an STI-branded short-throw shifter. It’s almost identical to the Limited Edition U.S. BRZ Series.Grey. Only 250 examples were offered in the U.S. market. RAIU Edition does get exclusive upgrades to set it apart from the standard sports coupe. The limited edition coupe is based on the BRZ Sport-tech RS, and gets special exterior upgrades including STI-branded front lip, and side sill and rear side spoilers and comes in one of Subaru’s most popular colors, an exclusive Cool Grey Khaki that’s only offered on the Crosstrek small SUV, WRX and WRX STI. Inside it gets black exterior accents. It also comes with the Sport-tech RS trim’s black leather and Alcantara seats with red stitching, 17-inch gunmetal alloy wheels, SACHS performance dampers and performance Brembo brakes. No Thanks! !, Send these 100 BRZ's back to Subaru and give us the S209 instead! Tired of Subaru sending us cars with only aesthetic upgrades and no actual engine enhancing, performance upgrades!! Surely you can't be serious? Tires, brakes and suspension are the 3 most important parts of a performance car excepting the driver. Keeping the car going the direction you want it to, transfer of power and stopping are all more desirable than "More Power" (in a Clarkson voice). The Raiu sounds like it has some serious upgrades to me.